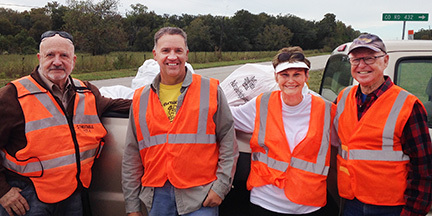 Fred Kanter, left, Mike Pudlo, Susan Bailey and Ken Wright joined Adopt-a-Highway Chairman Brian Jones and spouse Jerri Mills on November 8th in picking up trash along FM 2611 before and after the Churchill bridge. A total twenty bags of tossed-out-the-window trash was collected. It's a thankless task but not here -- THANKS!